Words can't express our excitement over being included in the Atria blog tour for Ugly Love, especially since Colleen Hoover is one of those authors who always leaves us in awe. Her ability to write a story so original, so unique, so surprising; well let's just say it's always exciting to start one of her books and wonder where the journey will take us. 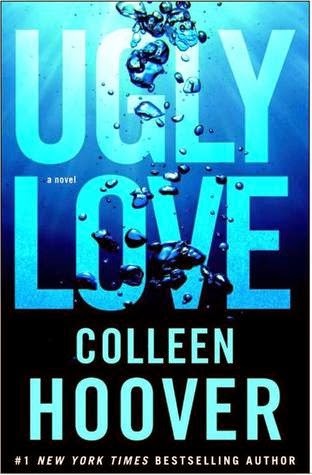 I am happy to report once again Colleen Hoover has given us another true original book and it's called Ugly Love! This book is different (how does she keep coming up with new ways to tell stories? ), but more importantly it's an all around incredible story. There is no doubt Colleen Hoover's mind works in marvelous ways which will always set her apart from the norm. Ugly Love is told so completely differently from anything I have ever read before. A portion of the story is told in the present day perspective of Tate, a young, hardworking girl who has just moved in with her older, protective brother until she can get a place of her own while she completes her degree. Another piece of the story is told from Miles, 6 years prior. What sets this book apart is not just the fact Miles' POV is told in the past, but more so the way in which Miles' story is told. It's as though the time you spend in the past with Miles is spent looking through a window, watching it happen. Those chapters are more poetic, which completely captures the essence of innocence, beauty and romance that usually accompany a person's first experience of falling in love. While a lot of books are told from alternating male/female POV it's typically the same story and time frame. What made this book journey so interesting for me was finding myself having different, sometimes conflicting feelings and emotions for these characters. It's amazing how changing the frame of reference can affect a person's reaction. Yes, there were so many times Miles' reactions or behavior in a situation should have frustrated me, should have made me dislike him but I simply couldn't, because I knew whatever the reason there must have been a good one, because at one time this man was capable of love, of knowing happiness, of truly living life and not just going through the motions. Miles is a pilot, just like Tate's brother, Corbin. And he lives across the hall from them. His first meeting with Tate is horrible, to say the least. However, it creates the mystery needed to make the story work. I absolutely adored Tate and loved her personality. She is fun, outgoing, confident, strong and independent, but she also has a tender heart, a soft spot for others. I am grateful she wasn't written as delusional. This girl knew from day one she was setting herself up for heartbreak, but she still jumped! For me, connecting with and relating to Tate was easy, and I think it's because of the way in which her POV chapters were written. The chapters spent in Miles past, while beautifully written, didn't really allow me to connect to him. Oftentimes with him it was as though I was an outsider watching a video slideshow of someone I didn't know personally. Colleen Hoover brings the ending full circle and without a doubt it was the icing on the cake, my favorite part. After wrecking us emotionally she puts us back together in perfect Colleen Hoover fashion. The ending was perfect, I couldn't have imagined anything better. When I wasn't even sure a HEA could be possible Colleen made it possible and I ended on such a high note, my only wish would have been more time with both characters in the present! This is without a doubt a must-read book for anyone, do not hesitate, just one-click!